Not one, not two, but three brand new comic book superstar websites have just been launched. We advise you pay them a visit. 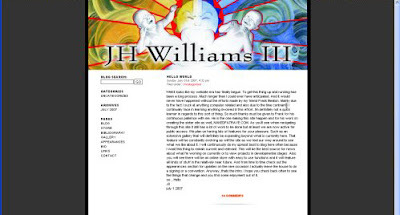 is the website of artist extraordinaire J. H. Williams III. You probably know him from his work on Promethea or Desolation Jones or perhaps a little series called Wild Girl from a few years back? is a "collection of fully-dressed comic book artists". The collective is comprised of Arthur Adams, Joyce Chin, Amanda Conner, J Scott Campbell, Michael Golden, Gene Ha, Phil Noto, Tim Sale, Bruce Timm, Matt Wagner and JH Williams III. Impressive, no? 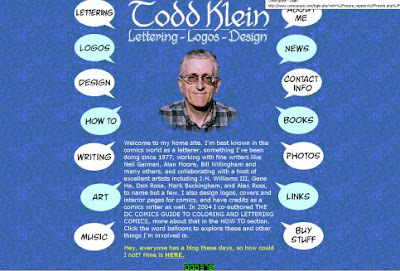 is the website of legendary letterer and winner of 90% of all lettering awards ever, erm, awarded: Todd Klein. Todd's site is packed with info about his career, tutorials, images, links... he's even selling albums! Some people seem to get more than their fair share of this "talent" stuff, don't they? Still, I'm not bitter.